Salomon Speedcross 3 CS - Salomon created the SpeedCross 3 Trail Running Shoe for women who can't stand to run on the pavement when they race on foot. Comprised of lightweight uppers and a flexible midsole and outsole, this shoe offers ample protection from hazards on the trail and an aggressive design that helps you move fast. Slide your foot inside and you'll immediately fall in love with the contoured and supportive fit, and just a single pull of the QuickLace tab tightens the laces and locks your foot in place. Salomon XA Pro 3D Ultra 2 - Salomon XA Pro 3D Ultra 2 Trail-Running Shoes for Women Features. Salomon XA Pro 3D Ultra 2 Trail-Running Shoes for Women. The Salomon XA Pro 3D Ultra 2 Trail-Running Shoes for Women are ideal for the avid runner. These shoes are designed with the energy cell 2 technology for a better performance and stability control. The quick-drying breathable mesh upper keeps you fresh and debris-free. Thanks to the sensifit and quicklace system with lace pocket, you can adjust them for a better and secure fit. Brooks PureCadence 2 - Brooks PureCadence 2 - Women's The Brooks PureCadence 2 running shoe features full-length BioMoGo DNA earth friendly midsole technology that is blended with Brooks DNA smart cushioning to tune cushion and response based on the needs of each and every runner. IDEAL Heel encourages contact points to shift forward, which aligns the joints and creates optimal energy return. Split toe enhances forefoot flexibility and independently empowers the big toe to engage the runner's natural stability and a powerful push-off. Asics GEL-Noosa Tri 9 - Strangle the competition with speed and agility in the Asics Women's Gel-Noosa Tri 9 Running Shoe. Vibrant colors, seamless construction, and super-sticky soles will make hopping out of the saddle and hitting the road an easy experience. If your racing triad involves early-morning acrobatics getting everyone out of the house, a mid-morning run, and the terminal event of carpool-kid wrangling, this cushy shoe will keep you going strong all the way through to the finish line of dinner with the family. Merrell Pace Glove 2 - Strike out on new adventures, clear your head or race your best time with the Pace Glove 2 from Merrell. The latest iteration of these barefoot running shoes for women is more comfortable, keeps rocks out better and keeps your feet warmer on frosty runs in the spring and fall. The Pace Glove 2 women’s barefoot shoe delivers a reliable, close to the ground feel while stimulating and strengthening muscles and realigning posture and gait. Nike Shox Navina SI - Nike Shox Navina SI - Women's The Nike Shox Navina SI running shoe is for the longtime female runner who is looking for a better ride and fit. Synthetic upper with synthetic overlays provides a flexible upper to enhance fit and feel. New women's specific five-puck Nike Shox™ platform adds more cushioning and a better overall ride. Carbon rubber in the heel offers excellent durability and rubber in the forefoot delivers a plush ride. Asics GEL-Kayano 19 - The Asics GEL-Kayano 19 Running Shoe for Women in Black/Electric Pink/Apple is the 19th version of the Kayano and each one keeps getting better. Improving the award winning ride, comfort and fit the Kayano 19 also drops a half ounce in weight, anf features the Asics Heel Clutching System and Dynamic DuoMax. This legend's upper fit also receives special attention with strategically placed seamless overlay construction making the GEL-Kayano 19 the best in its history. Salomon XR Mission - Tackle varying terrain with confidence in the Salomon XR Mission trail-running shoe. This short- to middle-distance women's training shoe features a breathable and abrasion-resistant nylon mesh upper with asymmetric thermoplastic urethane overlays to facilitate better heel-to-toe transitions and push-off efficiency. The Quicklace™ lacing system with friction-free eyelets takes just a single pull for a perfect fit; a strategically placed pocket hides the lacing away to ensure a streamlined stride. A washable, removable OrthoLite foam insole enhances comfort. Brooks PureConnect 2 - Embrace the ground beneath you with the featherweight feel and pliable flex of the PureConnect 2. This slim and nimble turn-hugger is the perfect fit when you crave less shoe and more freedom. A split toe groove extends toward the midfoot, engaging the natural movement of the foot and letting you feel every nuance of the run. With rad looks, the baby is ready to run, right out of the box. Brooks Ariel - A standout among control running shoes, the Brooks Ariel running shoe, like its big brother, the Brooks Beast for men, boasts a growing number of fiercely loyal fans who swear by its performance. Sporting a breathable Element Mesh™ upper, this women's running shoe combines maximum support and long-lasting comfort built upon a reliable, motion-control platform. The full-length Caterpillar Crash Pad delivers flexibility; a midsole stability web reinforces the foam layers without adding weight; and full-length Brooks DNA protects the foot while providing a customized ride with optimal cushioning. 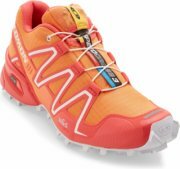 Salomon Speedcross 3 GTX Trail Running Shoe - Backcountry Exclusive - You won't find this version of the Women's Speedcross 3 GTX Trail Running Shoe anywhere else. In partnership with Backcountry.com, Salomon revisited the iconic Speedcross shoe and updated the design with a new colorway and a waterproof breathable Gore-Tex membrane. This shoe still feels feathery light, the fit is still as precise and comfortable as ever, and the outsole still offers aggressive traction, but now you can run straight through wet, sloppy conditions without worry. Salomon XA Pro Ultra 2 Shoes - Uninterrupted all-terrain performance is yours for the taking with the Salomon Women’s XA Pro 3D Ultra 2 Trail Running Shoe. The mesh construction of the upper brings intense breathability to keep your feet dry no matter what type of conditions you are mixing it up in. Ortholite insoles bring antimicrobial protection to keep things fresh and comfortable for long-term enjoyment. The Quicklace system cinches up mighty fast to cradle your feet with compassion in the midst of even the toughest runs. Brooks PureFlow 2 - Brooks PureFlow 2 - Men's The Brooks PureFlow 2 running shoe has a BioMoGo DNA midsole that features earth friendly midsole technology blended with Brooks DNA smart cushioning to tune cushion and response based on the needs of each and every runner. IDEAL Heel encourages contact points to shift forward, which aligns the joints and creates optimal energy return. Split toe enhances forefoot flexibility and independently empowers the big toe to engage the runner's natural stability and a powerful push-off. Nike Free 5.0+ - The Nike Free 5.0+ Running Shoe for Women in Dark Armory Blue/Armory Navy/Atomic Pink was developed by Nike's most innovative and creative employees, who spent 8 years studying the biomechanics of shoeless running. The result: An nconventional and flexible running shoe from the inside out with a natural and weightless feel. The Free 5.0+ provides foot strengthening benefits of natural motion, along with the cushioning, traction and underfoot protection of a traditional running shoe. Salomon XR Crossmax 2 - Take flight in the Salomon XR Crossmax 2 trail running shoe. With unparalleled speed and agility, this women's trainer flies effortlessly across both wet and dry terrain, providing lightweight stability for high-mileage runners. A dual-density EVA midsole promises dry comfort and maximum responsiveness. ProFeel Film is strategically placed in the forefoot to protect your feet from rocks, roots and other uneven surfaces on the trail. The Contagrip outsole maximizes speed by collecting the heel strike energy and transferring it back during push-off. Inov8 Roclite 268 - You'll make a run for it in this Roclite™ 268 trail runner from inov-8™. Good underfoot cushioning makes the 268 ideal for general purposes terrain and trails. Patent pending Fasciaband™ aids propulsion efficiency of the running cycle. Meta-Flex™ is anatomically aligned in front of the metatarsal heads for a natural fore foot flex. Met-Cradle™ cradles the fore foot behind the metatarsal heads for a secure foot hold. Breathable textile upper with a quick lace system. La Sportiva Wildcat - The Wildcat Shoe by La Sportiva is a stable, neutral, extremely well cushioned trail running shoe: our most cushioned trail running shoe. Built on the FriXion X-Axis rubber outsole the Wildcat digs into any surface for excellent traction and added cushion. The single density midsole provides excellent cushioning and is coupled with a plush LaSpEVA 2.4 mm lasting board. A great all around trail runner for people looking for great stability and cushion. New Balance 1400 - FEATURES of the New Balance Women's 1400v2 Shoe. SPECIFICATIONS of the New Balance Women's 1400v2 Shoe. REVlite midsole provides cushioning against impactNo-sew material applicationSynthetic TPU/mesh upper materialBreathable air meshWelded seams for durability and comfortBlown rubber outsole10mm heel-to-toe dropNdurance rubber compoundIntelligent geometries for inherent stabilityNo sew overlays in optimal areasThin TPU welds provide seamless applicationTongue tag lets you attach pins for your race bib. Adidas Supernova Sequence 5 - adidas Supernova Sequence 5 - Women's The adidas Supernova Sequence 5 running shoe features a stitched-on, microsuede upper that offers smooth forefoot fit and support for the natural flex zones of the foot. GeoFit® collar adds anatomical fit and comfort. ForMotion® stability unit provides motion control and ground adaptability. adiPRENE®+ offers full-length forefoot cushioning. Pro-moderator™+ lightweight, durable midsole wrapped stability element eliminates the risk of midfoot irritation. adiWEAR® outsole for best durability in high-wear areas. micoach compatible. Saucony Xodus 3.0 - Tackle uneven terrain and muddy trails in the Saucony ProGrid™ Xodus 3.0 shoe. This women's trail-runner features an internal fit system that hugs the foot to handle various terrain. The SRC impact zone and SRC forefoot cushioning ensure an even, steady stride, while the SSL EVA midsole maximizes rebound and minimizes weight. The Heel ProGrid™ with Respon-Tek™ cushioning absorbs impact, dissipates shock, and sets the foot up for a smooth transition in the Saucony ProGrid™ Xodus 3.0 trail shoe. Hoka Oneone Mafate Trail Running Shoe - It may seem contradictory to say that the big, oversized sole on the Hoka One One Women's Mafate 2 Trail Running Shoe gives you better connection to the ground, but it works. Thanks to the sole's surface area that's twice as large as that on traditional running shoes, the Mafate 2 grips the trail like nothing else and rolls over the gnarliest technical terrain like a tank ... a featherweight tank. Brooks Ghost GTX - Regardless of the weather, stay dry and enjoy the sleek, foot-hugging fit of the Brooks Ghost GTX running shoe. Engineered to set the foot in an efficient, balanced position from heel strike to toe-off, this women's running shoe features a GORE-TEX membrane for both complete waterproof protection and high breathability that allows internal moisture to escape. Anatomical Brooks DNA provides a customized ride; a BioMoGo midsole and S-257 Cushsole lend plush comfort to every foot-fall. Nike Dual Fusion Run - Nike Dual Fusion Run - Women's The Nike Dual Fusion Run running shoe is for the modern runner looking for the ultimate combination of cushioning and a smooth ride. Sandwich mesh and leather upper combined with a dynamic midfoot system provides a superior fit and supportive running experience. Dual-density midsole with a firm Phylon™ carrier and a soft Phylon™ core creates a smooth, cushioned ride. Waffle® outsole pattern design offers a smooth heel-to-toe transition.